We’re proud to support the nation’s first Plant Power Day, taking place on Wednesday, 7 March 2018. Its aim is to encourage everyone to put plant-based foods first for all food and drink choices, at least for one day. It’s easy to take part: whether you start your day with a smoothie or host a ‘planquet’ – a meal that puts plants first – making vegetables, fruit, wholegrains, pulses, legumes, nuts and seeds the star of the show. Breakfast, lunch or dinner with friends or family, or even just a small snack, you’ll help spread the word about the benefits of a plant-based diet. Plant-based eating doesn’t mean we have to give up meat and animal foods. Simply starting to add more plants to our meals can all help! Why take part in Plant Power Day? As we’ve posted on our recent blogs, plant-based diets are rising in popularity. We see this as a good thing because of the many benefits such a diet can bring. It’s great for our health, the planet and for economics. It may be surprising to know that the way we are currently producing and eating food and using the earth’s resources means that we would need two planets by 2030. This is clearly not sustainable. Have a think about the meals you eat on a typical day and how you could adapt them to be plant based. By experimenting with plant-based foods for Plant Power Day, you may be surprised at how satisfying and tasty the options can be. Add beans, lentils or tofu to stews, soups and curries. 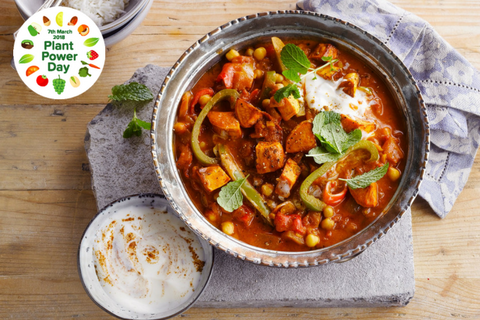 Try the delicious sweet potato and chickpea curry (pictured above). Have a go at making some tasty falafels in a wholemeal pitta, like the oven-baked version by Dietician Anita Bean. Use nut and seed butters on wholegrain crackers or on an apple for a healthy snack. Get involved and have fun giving your meals a makeover, putting plants FIRST. Please like and share this post, suggest your own favourite recipe and help spread the word! Try a new recipe or share one of your own favourites. Post a picture of your #planquet on Twitter and Instagram for a chance to win a hamper of the Alpro plant-based range, a KeepCup and a subscription to AllPlants. Put the plant-foods first and snap away! As weight-busting January came to an end it brought to light a new, hard-hitting report from the WHO Commission on Ending Childhood Obesity (ECHO), with the alarming headline that, globally-speaking, at least 41 million children aged under five years are obese or overweight (1). Applying the emergency brake on obesity: Whose role is it? Unsurprisingly, The ECHO report, based on a review of the evidence, highlights childhood obesity as a complex and multidimensional problem. 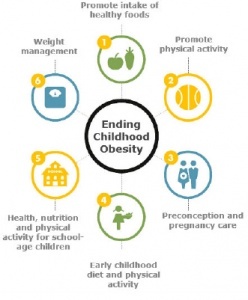 However, according to the report, the greatest obstacle to effective progress on reducing childhood obesity is a lack of political commitment and a failure of governments and other actors to take ownership, leadership and necessary actions. The WHO calls on governments to take effective leadership on obesity by incorporating large-scale cultural environmental and behavioural change without which change simply will not happen. We know that obesity has a massive impact on a child’s quality of life, from physical as well as psychological perspectives; studies also show that obese children face significant risk of obesity in adulthood, which itself poses major health and economic consequences for families and wider society (2). The report paints a bleak picture that the prevalence of children being overweight under the age of five has risen, from 4.8% in 1990 to 6.1% in 2014, or an increase of 10 million children. On closer scrutiny, the statistics reveal that the most significant change in prevalence has been in Asia and Africa, driven by globalisation and urbanisation leading to obesogenic environments. Another major driver highlighted was the marketing of ‘unhealthy foods and non-alcoholic beverages’ which feature heavily in the recommendations. To tackle the obesogenic environment and norms. To reduce the risk of obesity during critical periods in the life-course —preconception and pregnancy, infancy and early childhood, and older childhood and adolescence. Implement comprehensive programs that promote the intake of healthy foods and reduce the intake of unhealthy foods and sugar-sweetened beverages by children and adolescents. Implement comprehensive programs that promote physical activity and reduce sedentary behaviours in children and adolescents. Integrate and strengthen guidance for the prevention of non-communicable diseases with current guidance on preconception and antenatal care. Provide guidance on, and support for, healthy diet, sleep and physical activity in early childhood and promote healthy habits and ensure children grow appropriately and develop healthy habits. Implement comprehensive programmes that promote healthy school environments, health and nutrition literacy and physical activity among school-age children and adolescents. Provide family-based, multi component, lifestyle weight management services for children and young people who are obese. While the report highlights, the limited potential of any single intervention to provide a solution, within these overarching recommendations are more specific targets, focussed on tackling the obesogenic environment. Targets for the food industry feature prominently. Within the first recommendation, there is a call to implement ‘effective taxation on sugar-sweetened beverages’ and to implement context-specific nutrition information, and ‘interpretive’ front-of-pack labelling. The food and drink industry, retailers and marketing stakeholders are called upon to clampdown on junk food marketing with the report recommending that advertisements for ‘unhealthy products’ should be banned from children’s TV, schools and sports facilities. Sizing up is also singled out as a particular issue to address and there is scope and opportunity for the industry to address appropriate portion sizes. Schools also offer a key opportunity for action and the report’s recommendations focus on: standards for school meals; elimination of so-called ‘unhealthy foods’, such as sugar-sweetened beverages and energy-dense, nutrient-poor foods, in the school environment; informed nutrition education as part of the core curriculum; and ensuring levels of physical activity for all children, meet current recommendations, with comprehensive programmes that reduce sedentary behaviours in children. Similarly, health professionals have a major role to play if the recommendations are to be in any way implemented which will take considerable investment in the work-force to achieve the skill-sets required, as well as the resources. The roles that schools and health professionals have to play can only be realised by ensuring that there are measures and funding in place to support them. Even before birth, the behavioural and biological responses of a child to the obesogenic environment can be shaped by processes (3). x7Hanson, MA and Gluckman, PD. Early developmental conditioning of later health and disease: physiology or pathophysiology?. Physiol Rev. 2014; 94: 1027–1076 CrossRef | PubMed | Scopus (30)See all References7 Having clear guidelines which start to tackle that environment is a starting point with independent research being used to show what works. This must start with giving schools and health professionals the support to run evidence-based interventions: for example, dietitians having a role in ante-natal settings to advise mothers-to-be on healthy diets for themselves, and as gatekeepers for the whole family; schools to have teachers who are able to deliver nutrition education as part of the curriculum, as well as giving space in the school environment for more movement. One of the recommendations is to ‘make food preparation classes available to children, their parents and caregivers’ – even to achieve this single measure, vast investment and training is needed. Caterers also have a crucial role, especially those working within the public sector such as in schools and hospitals and early-years settings and are called upon to meet the recommendations to limit consumption of foods high in fat, sugar and salt; ensuring availability of healthy foods. 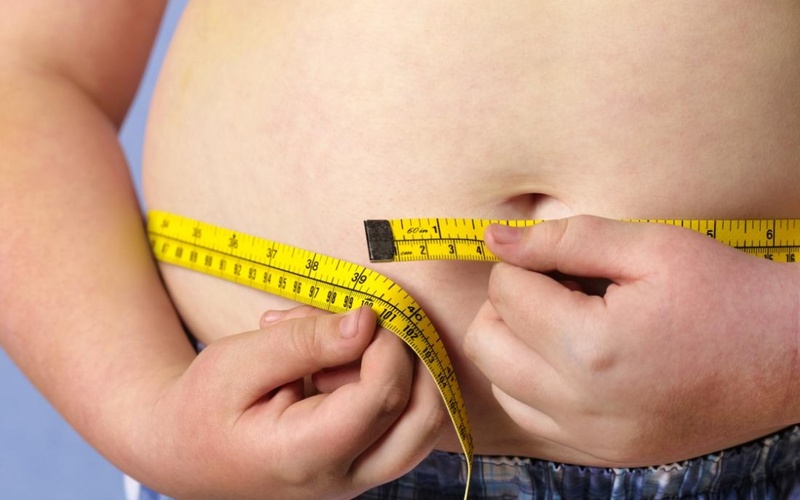 Whilst some of the report’s recommendations are in place already in the UK, for example, the National Child Measurement Programme to help monitor weight changes http://www.nhs.uk/Livewell/childhealth1-5/Pages/ChildMeasurement.aspx the UK has yet to put in place resource for dealing with those found to be overweight as well as making recommendations for weight gain in pregnancy. Research priorities are needed so that the evidence is in place to make UK-specific recommendations. But, as the McKinsey report (5) highlighted, lack of research should not be a barrier to action. So does accountability now lie within government versus local communities, individual responsibility etc? We have long known and as the ECHO report states ‘without joint ownership and shared responsibility, well-meaning and cost-effective interventions have limited reach and impact’. However, this joined up thinking and action has never happened and is unlikely to happen without clear co-ordinated leadership, appropriate powers and accountabilities with specific targets. Will Cameron now lead us with a ground breaking strategy for the UK that is lead right from the top with a COBRA style committee to truly address the nation’s health crisis in his forthcoming childhood obesity strategy? Will he be brave or will he leave it to his successors to sort out? No government has ever achieved this to date. Yet we have never needed it more than it is needed now. Let’s hope he has his eyes wide open on and the determination focus and foresight needed. The National Obesity Forum has called for a tax on sugary drinks this week at more than double the level recommended by Public Health England, in a manifesto to improve public health launched to mark the beginning of its JanUary campaign (formerly National Obesity Awareness Week). The manifesto was presented at the All-party Parliamentary Group on Adult and Childhood obesity at the House of Commons re-launched today which we attended. The Forum, which comprises of practicing healthcare professionals and clinicians, has claimed that only a 50 percent tax on sugary drinks will prompt a change in consumer behaviour. It has, however, rejected calls for a tax on food products, claiming such a move would unfairly penalise low-income families – instead insisting the Government should abandon the Responsibility Deal and mandate the reformulation of foods to reduce levels of fats, sugars and salts. Other recommendations in the Forum’s manifesto, include GPs routinely measuring the weight and BMI of young children, including water in Public Health England’s relaunched ‘eat well’ plate, banning fast food outlets near schools, and insisting on a watershed ban for junk food advertising. The Forum has also called for the expansion of specialist non-surgical weight management treatment services across the UK, and improved information on local weight management resources and services for GPs and nurses. Unfortunately this meeting was very poorly attended by MPs. Let’s hope that this is not a sign of things to come with Cameron’s much anticipated childhood obesity strategy. The National Obesity Forum is encouraging members of the public to make healthy New Year’s Resolutions and participate in a sugar reduction challenge as part of the JanUary campaign. We enjoyed attending Parliament yesterday. However, it was not the usual kind of meeting! Originally set up to test MPs knowledge of healthy eating, hydration and physical activity against primary school pupils in the House of Common. However, MPs not wishing to be outdone by their juniors, decided instead to head each of the primary school teams. 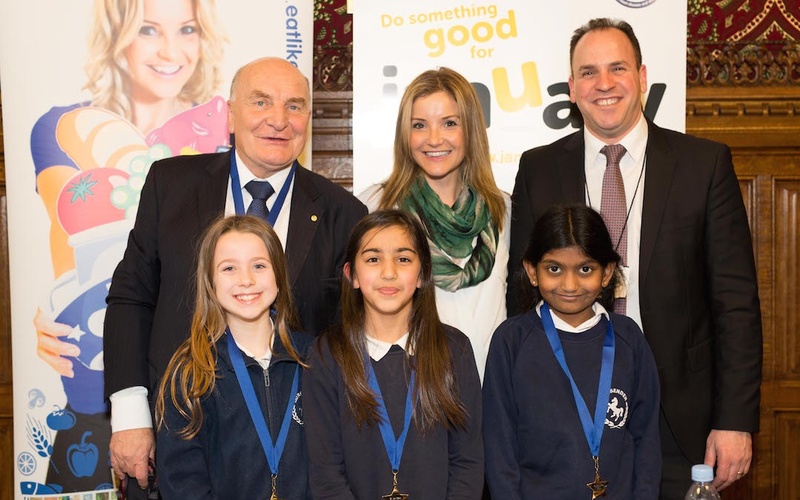 MPs including Steve Pound, Carol Monaghan and Rupa Huq joined teams from Berrymede Junior School, Horsenden Primary and Montpelier Primary in the quiz, which was chaired by former Blue Peter presenter Helen Skelton. The quiz was based on the Eat Like A Champ programme, a Change4Life partner scheme designed to promote healthy diet and exercise amongst primary schools pupils aged nine and 10 years. Ms Skelton has previously completed the Namibia ultra-marathon, kayaked the length of the Amazon, and to the South Pole. The quiz was part of the JanUary campaign, which is led by the National Obesity Forum to encourage healthy choices amongst the public and tackle a growing obesity crisis. Participants faced six rounds of lively questions with each team of school pupils also asked to deliver a presentation on why healthy living is important. The quiz was won by Montpelier Primary on a tie-break round. The competitive nature of both MPs and pupils soon came to the fore with speed-lightning pressing of their buzzers before Helen Skelton had a chance to finish the questions. Disputing amongst teams also ensued forcing Helen Skelton to make some hard marking decisions. Questions focused predominantly on the food groups from the Eatwell Plate. The most enchanting part of the day, came when representatives from each school braved the audience to present their prepared speeches on the importance of exercise and physical activity. The pupils’ motivation, enthusiasm and level of knowledge was a true inspiration to all. The Eat Like A Champ programme is run by Danone and was developed in collaboration with the British Nutrition Foundation. “Of course this a bit of fun, but it’s making a very important point. Namely that we need to ensure our children are introduced to good nutrition and hydration habits at a young age. We know from the National Child Measurement Programme that the number of overweight and obese young people remains high, and that this is a particular problem in deprived areas. Many children are sedentary and consume large quantities of poor quality foods high in salt, sugar and trans-fats. 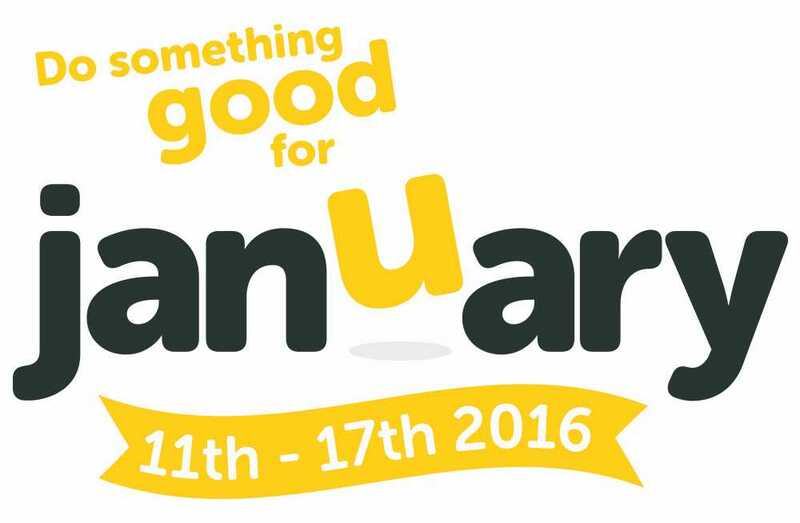 The National Obesity Forum and supporters of JanUary are encouraging the pubic to commit to healthy New Year’s Resolutions throughout the campaign (11-17 January).